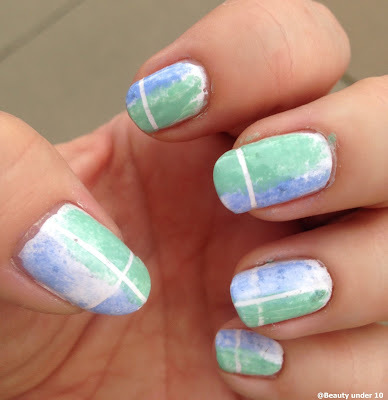 With spring slowly approaching I wanted to get in the mood and what better way than with some nail designs! I used bright fun colors to give my nails a little bit of pop. I love this minty green polish by Essence called Play with My Mint and this beautiful light blue polish Boho Blues by China Glaze, they are the fun colors I needed. 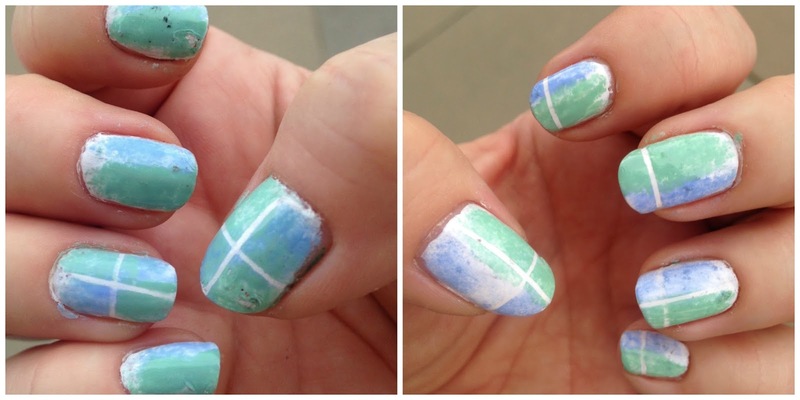 I used Nail Striping Tape from Nail Polish Canada but if you like you can also cut small strips of scotch tape. I also used a makeup sponge to dab the nail polish color onto the nails. Apply base coat to protect the nails. Apply a White base color. I found this made the other colors more vibrant. Let completely dry. Apply the nail striping tape to the nails in a “t” shape (one vertically and one horizontally), you can also apply a strip to the tip of the nails. Apply some blue nail polish to a corner of the sponge, gently dab onto one side of the nail – you may need to do this a few times for the best opacity. Repeat with the green polish. Before the nail polish dries, remove the striping tape. Apply a Top Coat for a nice glossy shine. I thought this was a fun way to brighten up the dreary days. Hope you liked this design!